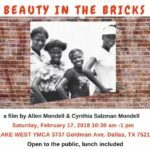 She was 12 when she first saw Allen Mondell and Cynthia Salzman’s award-winning film ‘Beauty in the Bricks’. Even in the bleakness of a West Dallas housing project shelter, the film sparked something within her. Thanks to Olinka’s efforts, a new generation will now find their love for home in ‘Beauty in the Bricks’.